Making printed circuit boards is a necessary skill for being able to build electronic gear above a very simple level. This article describes a set of techniques, tools, and materials used to turn a copy of a circuit pattern into a finished board by transferring the pattern onto a copper-clad blank, and then etching off the excess copper. This is direct etching, as opposed to the photographic techniques used in other processes. While my audience is specifically DIYers who want to build guitar stompboxes, the techniques are applicable to many other devices and designs. I do not cover creating your own printed-circuit patterns; that's a much more involved subject, and, if you are interested, you should seek references written by experienced designers. I presume here that you have either drawn out a pattern that you want to make into a board, or, more likely, that you have a jpeg or pdf of an actual-size pattern from an on-line source that you want to transfer to copper using Press N' Peel film. The best base material is FR-4, which is a laminate of fiberglass and epoxy resin. Other composites of phenolic, epoxy resin, cellulose and fiberglass are also used. There are several brands out there. You print your design on it using a laser printer or photocopier, and then iron the pattern onto copper. I have long used Techniks Press N' Peel (P-n-P). Please note: P-n-P will not work with inkjet printers. You must have access to a laser printer or photocopier. Also, compatibility problems have been reported with the toner used in Brother printers. I use this for setting up the printing of a P-n-P transfer. A small glass, rubber, ceramic or rigid plastic (polystyrene, polyethylene or Lucite) tray, large enough to hold the board with room around it to agitate, and an inch or so deep. Used with a little BonAmi or similar abrasive cleanser for cleaning the copper surface. Unless you wear rubber or plastic gloves, you need some way to get the board out of the etching solution without sticking your fingers in it. A pair of plastic forceps or tongs is very helpful. If you are creating your own pattern rather than relying on a published design, you may want some rub-on transfer patterns and resist tape. The brand most people know is Datak. Two pieces of FR-4 blank board, each 3" x 4"
The pattern is in "X-ray" view, meaning that this is how it appears if you are looking at it through the component side of the board. The finished board will have exactly the same outside dimensions as the perfboard version, and it can be used as a drop-in replacement if you want to build a Tweak-O with it. I'll say more about this when we are done. Our first job is to cut down a piece of PC board stock to the size of the board we want to make. The Tweak-O board is 2 13/16"long by 1 7/8" wide. I'll show you a score-and-snap first and then address alternate methods. A cutoff wheel on a Dremel tool also works very well. However, be aware that these attachments are inherently dangerous and subject to shattering without warning; eye protection is an absolute must! First, a note: Many references, both on-line and print, detail this process. The ones I have seen agree in general outline and differ in details. Before you write to me saying that "this source says to do it a different way!," I'm letting you know that those other references may well be fine. As for me, I have created many boards using the procedures I show here, and I know that they work. Press-n-Peel (P-n-P) film comes as an 8 1/2" by 11" sheet. It has a shiny side, and a dull, emulsion side. We will print the PC board pattern to the emulsion side. The toner (actually a mixture of plastic and carbon black) from the laser printer or photocopier will stick to the emulsion, so the pattern transfers to the P-n-P. Then we will iron the pattern from the film onto the copper, in the same way you might iron a design onto a T-shirt. 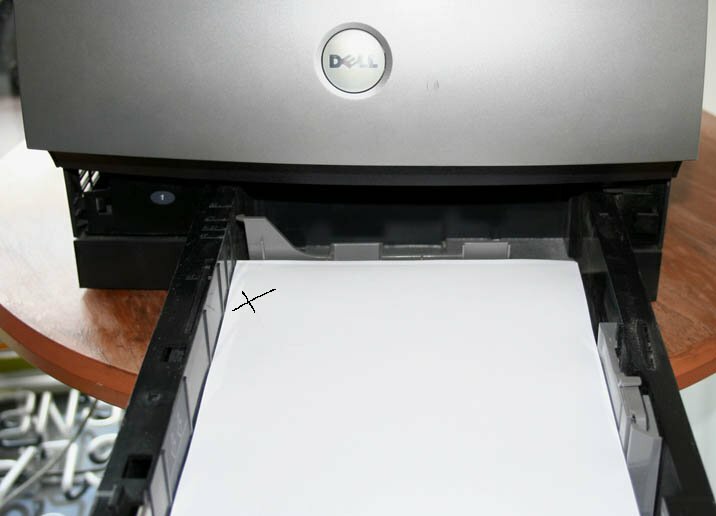 Looking at the result, it's clear that this printer turns the paper over when it prints. Also, the top of the printed image is at the edge of the paper that is at the front of the printer. To anticipate a couple of questions: I have never had a problem with paper jams when using this technique. I have not tried it with a photocopier, but I expect that it would work. Set up your ironing board, and have available a piece of hard sheet material to use as a base under the blank (I use a wooden board.) Set the temperature control and warm up your iron. Unfortunately, every iron is different, and the "right" setting will vary from unit to unit. Techniks recommends using the Polyester setting. If your transfer has too many voids or otherwise didn't come out well, just remove the pattern by rubbing with a clean rag wetted with acetone and do the transfer again. Note: Acetone is volatile and extremely flammable. NEVER leave a container of acetone lying open! Especially if there is a source of heat or sparks in the area, you are asking for fire or explosion! If you can't find transparency stock, use software to mirror (some programs say "horizontally flip") the image and then print to tracing paper, or even plain paper. If your pattern is a jpg, most graphics programs (like Paintshop) will mirror the image. If it's a pdf, there are shareware programs (I have used Ghostscript) that will convert pdf format to jpg so that you can do the mirror. After you print, leave several hours for the ink to dry thoroughly! Once you have the pattern defined on copper, the board is ready to etch. includes notes on using baking soda to turn the solution into solid waste that can safely be thrown out with regular trash. I had never used this material before trying it for this article. The directions on the label suggest a dilution of one-half pound by weight to one gallon of water, which I translated to one-quarter ounce by weight (about a rounded teaspoon by volume) per four ounces for making a small batch. I used the hottest water I could get from my tap and stirred the powder in with a plastic spoon till it dissolved completely. One caution: When diluting Sodium Persulfate, never add water to a mass of the powder; always add the powder to the water. Doing it the wrong way can result in spattering that verges on explosive. 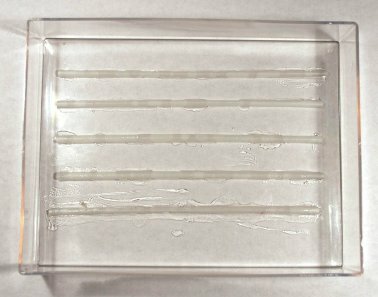 Other references say that Persulfate solution should be warmed slightly during etching (often by placing the tank in the middle of a pan of hot water) to speed the process, and I'm going to try this next time.